Steve Brooker will be warning against ill-discipline as Banbury look to make it three wins on the spin. Banbury entertain Bromley & Beckenham in Saturday’s South Premier Hockey League fixture and a would be enough to go above the visitors. Brooker’s boys beat basement boys Henley 6-2 despite an early set-back. And twice in the second half, Banbury had to make do with ten players following more ill-discipline. Henley’s lowly position belies the quality and tenaciousness they have. They took a second minute lead after their smart restart from a free-hit spilt the home defence and Chris Green beat keeper Steve Hicks. But Banbury capitalised on greater possession to regain control with Josh Nunneley levelling from a penalty corner. But the best was yet to come. It started with Simon Boardman finishing a well-rehearsed penalty corner move on the far post with less than ten minutes remaining. The home side romped ahead as Boardman went on to claim a first half hat-trick, finishing a left-sided move from Jaz Singh to Richard Foreman to Callum White, before completing a Steve O’Connor and George Brooker move. The home side lost their way in the second half with a green and two yellow cards reducing them to ten players and Henley won several penalty corners before Alex Land finished well to reduce the arrears. With the home side reduced to ten players again, the visitors were awarded a penalty but it was put past the post, much to Banbury’s relief. Banbury survived the threat and bounced back with O’Connor finishing a slick right-sided move. Despite the disciplinary disruptions Banbury pressed forward with White floored after beating two defenders to win a penalty which was also put wide. But Brooker finished another scything move, crashing home from long range. 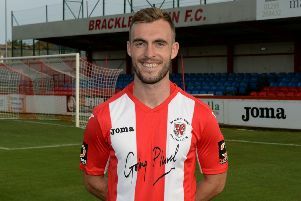 Brooker said: “The good patches in our game our getting better and getting longer but we could easily have thrown away all of the good work in the first half when ill-discipline after the break repeatedly reduced our numbers. The improved goal difference is great boon and puts us level with our opponents this week Bromley & Beckenham.